Human spleen. 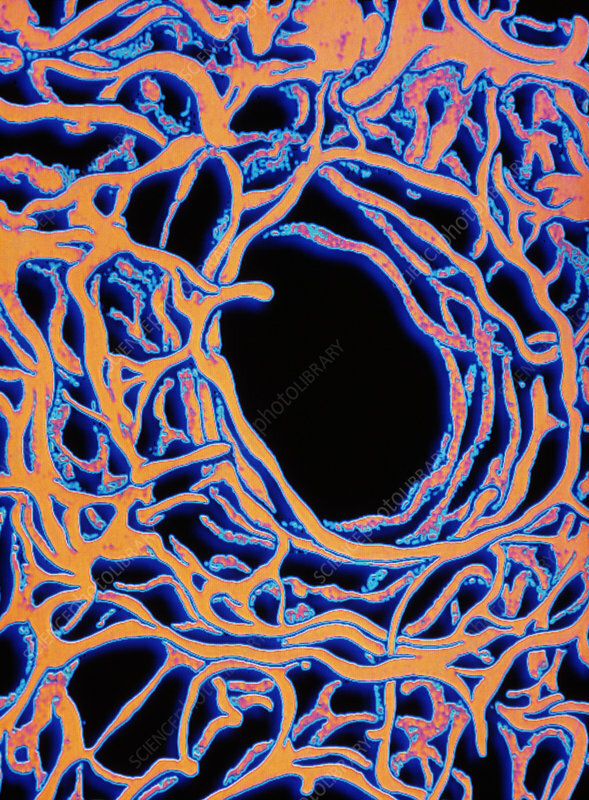 Coloured Scanning Electron Micro- graph (SEM) of a section through the human spleen. Here, the fine network of reticular fibres known as trabeculae is seen. Trabeculae form a framework within which the functions of the spleen take place. The spleen is part of the lymphatic system, and is involved in processing white blood cells (lymphocytes). Lymphocytes occur in round nodules, of which the framework of a nodule is seen at centre. Between the nodules there is a matrix containing red pulp, made up largely of red blood cells. The spleen also regulates the number of red blood cells in circulation in the bloodstream. Magnification: x4000 at 6x4.5cm size.